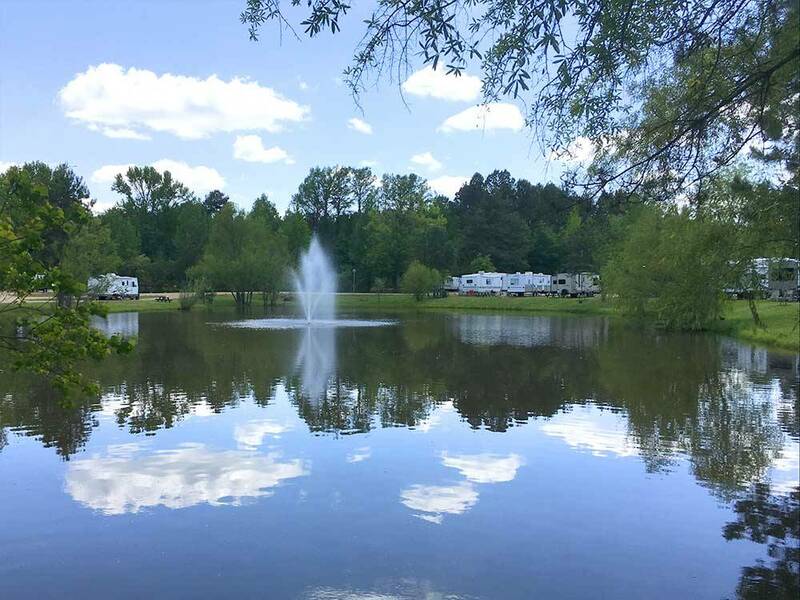 Magnolia RV Park is clean, pleasant and a friendly RV Park. Hosts are great and can help with anything. Great bird watching in the area. Wonderful little RV park. The owners (a couple) are friendly and helpful. SPOTLESS restrooms/showers - like a fancy hotel! Washers & dryers (2 of each) are new/clean and the price is reasonable. The office/waiting area is nicely decorated and there's a couch to sit on. Free coffee and reading materials. The RV camp spaces are roomy so you're not right on top of someone else's RV. There's a small pond with ducks swimming around. Quiet neighborhood and you can walk down the scenic/peaceful street for at least a couple miles (you may see a horse and a donkey in one yard). The RV park is quiet and people are respectful. Thanks for doing a great job, owners! We stayed at this beautiful, small, and very quite campground in April, 2018, on our way home from Arizona. The owners were very friendly and most accommodating. If we are ever in the area again, we will most definitely stay at this park. This RV park provides a friendly, down-home experience. The facility provided the essentials with cleanliness and nice décor. The showers appear to have new tile. Park staff welcomed us at our site with assistance provided in electrical and water hook-up. We are so glad you loved our small park. Our staff does a great job of accommodating our guests. We hope to see you again real soon. Accomodating staff, outstanding grounds, quiet and friendly in the country side of the town. All the things we like. Long pull through, modern utilities. This is one to return to. As an aside, we had a blowout 10 miles out. Good Sam Roadside assistance had a local shop, Fowler Wrecker service, out to help us PRONTO! The next day ABC tire, in town, gave us first class service also. Nice college town, friendly folk, comfortable feeling. We visited this park two years ago, right after the ribbon cutting, and thought then that it had a lot of potential. Now, two years later, it all looks exactly the same. Not bad, but not changed or enhanced, just the way we left it. The roads and sites are gravel, there are lots of lawns and grass around each site. The sites are level and hook ups easy. There is a pond in the middle of the park with well maintained landscaping. It all looks very clean and neat. Not all sites sites have picnic tables and there are no fire rings. The cable and wi-fi both have strong signals and work well. The office staff and workampers are very helpful. They offer discounts for FMCA, SKP's, and GS which is good because for a simple park, it is rather pricey. The Main Building serves all functions as office, laundry, showers, and bathrooms. All these functions are reached upon entering this main building which is odd. The two unisex showers are very big with a complete bathroom as well. They are sparkling clean and even decorated. Unfortunately no camp store of any kind!! Since first seeing this park it has almost filled with permanent and long term residents. Too bad, it would be a great rest for travelers. Now maybe six sites are for overnight guests. All sites on the pond are long term residents. Some of the permanent trailers toward the rear of the park show the wear and age of just sitting, some have the outside clutter that marks a permanent resident. Common RV Park amenities that I thought would be added never happened, e.g. dog park, kids' playground, pool, park style benches around the pond, camp store. I guess because their residents became their focus. Be sure to call for a reservation, as this is being written there are no more overnight spots. This a clean and secure overnight stop, but not much more. Our lovely RV park has had many changes since your last stay, so we hope you will come back to see our growth. Since this is a relatively new park, we are constantly updating our facilities. We have added park benches around the pond, a fenced dog park area, horseshoe pits, and we now sell RV supplies in our office. We have plans to add a community fire ring area in the near future. We also offer military discounts and participate in tents for troops. In regards to your comment about catering to permanent and long term residents, probably 80% of our sites are rented monthly, but they are construction workers, SAU students, and people moving to the area. They are here anywhere from two to six months. Our students are all super kids and return each semester till they graduate. We keep around 5 overnight sites for travelers. If you come during the Magnolia Blossom Festival we may be full as it is a popular event for this area and we people make reservations early to ensure a spot. We do hope you will stop back to check out our park again on your next trip through. We would love the chance to show you our changes.